NANKING CHERRY - a medium sized, spreading shrub native to China, Japan, and the Himalayas. Winter hardy, moderately fast-growing. On favorable sites it may reach a height of 6-10 feet. Prefers loamy soil. 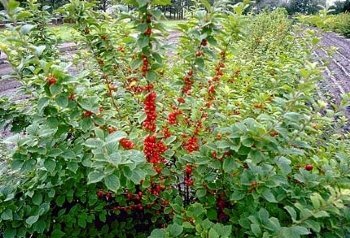 Produces attractive white to pink flowers and small, edible red cherries. Needs 2 plants for pollination, but will cross pollinate with plum and pin cherry.